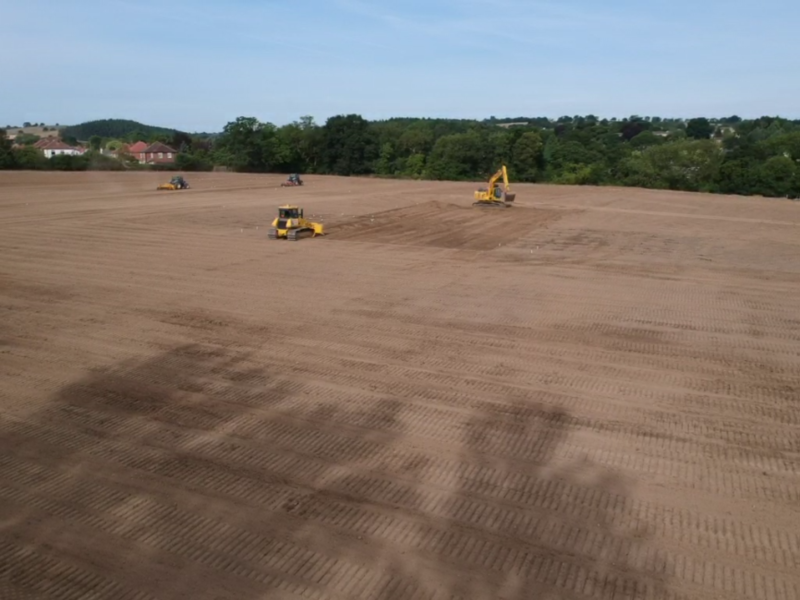 On the outskirts of the North Yorkshire town of Harrogate, a huge project is coming to fruition to provide a 'homeless' junior football club with their own dedicated grounds to boost community sport. Greg Rhodes reports. 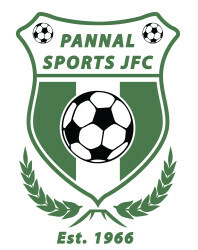 Pannal Sports Junior Football Club is a Charter Standard Club founded in 1966. It runs twenty-three squads ranging from U5s to U18s and currently includes more than 490 players and some 100 coaches and helpers among its ranks. Run by a small, dedicated committee of volunteers since 2007, the mission to find a place to call home after more than fifty years as a 'wandering' club is nearing its end as recontoured and prepared former farmland turns green as the prospect of year-round sport nears. The club's U5s, U6s and U7s train on Sunday mornings, U8s and upwards on Saturday mornings - not on a single coordinated site, but a merry-go-round of hired public and private pitches across Harrogate. But that's all about to change in 2019. 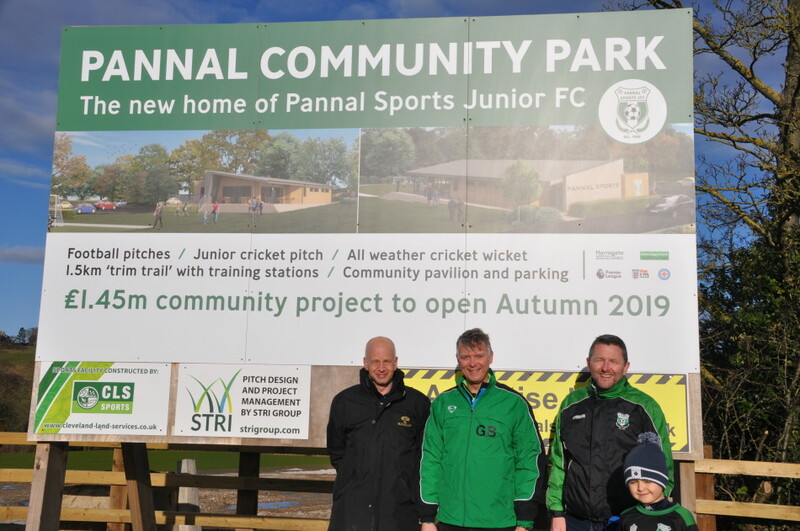 Work started last May on Pannal Community Park, a sporting hub for the district's grassroots provision and a permanent home for Pannal Sports JFC. The oldest, continually active junior football club in Harrogate, it is witnessing a dream come true after ten years searching for and negotiating terms on its new headquarters. Made possible by Premier League & The FA Facilities Fund, Football Foundation and Harrogate Borough Council grant awards, Pannal Community Park is an impressive expanse of sporting commitment - 3.25 hectares of a total 4.29 hectares devoted to playing surfaces on three purposely-fashioned terraces, the stages for junior and senior football and cricket. Committee member Mark Taylor is the ground's team leader steering the £1.45m undertaking, which embraces eight natural pitches, pavilion, function room and facilities for other sports clubs and community groups - oh, and a 1.5m wide, 760m long trim trail skirting the perimeter of the Park. 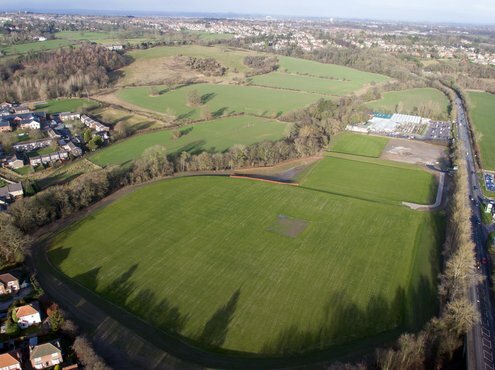 "Phase 1, constructing the pitches and cricket square, complete with drainage, is complete," he says, "and the spring and summer will see the maintenance programme progress to prepare the surfaces for sport." 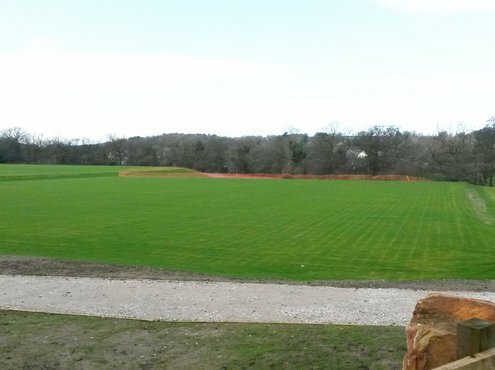 "Phase 2 comprises building and fitting out the clubhouse and constructing the car park at the lower end of the park. Funding for this is ongoing but, once it is in place for that, work will begin." Pannal Sports JFC worked in partnership with the Football Foundation and the County FA to secure a grant of more than £350,000 from the Premier League & The FA Facilities Fund. Chairman Nick Viles said: "Having a place to call home has been the club's dream since I joined sixteen years ago. We would never have realised it without the hard work and dedication of our grounds team, led by Mark Taylor, and the expertise and guidance of the Football Foundation, as well as the support of Harrogate Borough Council, club parents and the local community." Encouraging grassroots sports is a major priority for the club, Mark adds: "We want this to be a facility that benefits the wider community. It has taken more than ten years to reach this stage, with the first seven of those taken up with searching for a site. "The last three years have been extremely busy," he explains, "designing the scheme, gaining planning permission, securing a long-term lease and appointing a contractor." 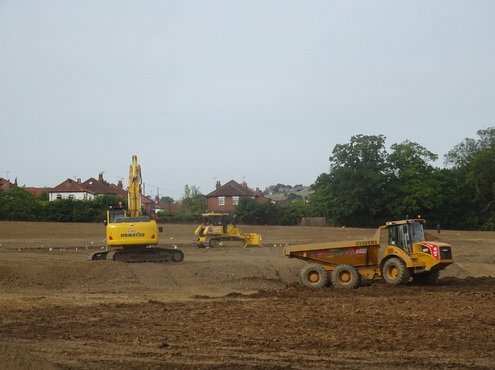 A number of challenges had been overcome before the work could start, he continued "but we are all looking forward to being able to use the new pitches this autumn". Football Foundation chief executive Paul Thorogood adds: "Funding from the Premier League, the FA and Government, through Sport England is playing a vital role in making the project a reality. Thanks to their investment, Pannal Sports JFC is one of the many clubs and organisations across England set to benefit from a state-of-the-art facility." This was a ten-year mission that "picked up speed over the last four years", states Club Secretary Graham Barker. 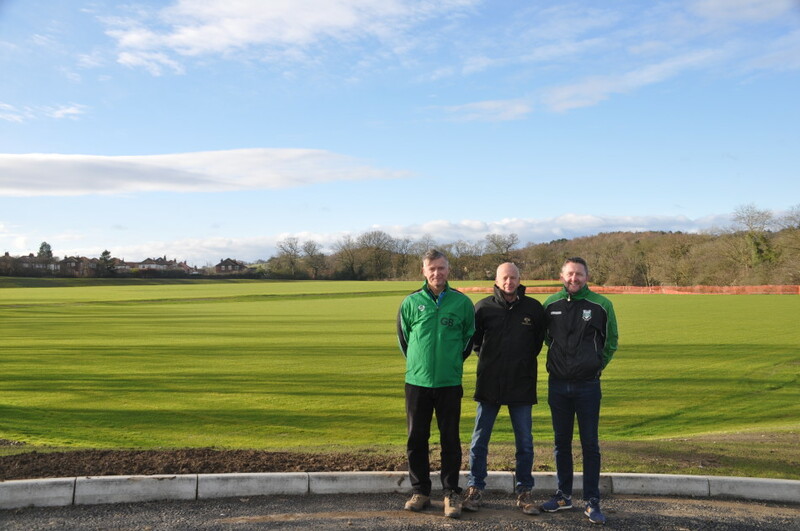 "Constructing the pitches was our first priority and, although we had attracted the funding necessary for the work to be completed, in part from Harrogate Borough Council, along with club funds that have been raised over the last ten years." "S106 money [arising from building gains] is released to the council at pre-set times rather than as a lump sum, which creates an issue as 90% security of funding has to be in place as a condition for the project to proceed. This is hampering Phase 2, but we will continue to secure other funding sources." 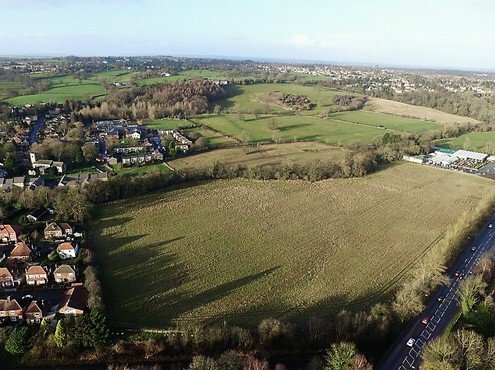 A field on the edge of Pannal village was identified as a potential home. Former arable land leased from the council, it had last been farmed up until 2017. "The club wished to retain its Pannal heritage," Graham continues, "and we had been in talks with the council for more than ten years." Pannal Sports JFC has expanded dramatically since its formation in 1966 - a seminal year for English football, when the national team lifted the FIFA World Cup on home turf at Wembley. Their growth made the mission for a club base all the more critical. "There is a lack of quality natural grass pitches in the area and our twenty junior teams play on several different sites currently, so everyone relishes the prospect of consolidating games at a purpose-built ground, with all facilities to hand and professionally maintained high-quality surfaces." A crowded calendar and other sporting commitments will prevent Pannal Community Park from hosting all club fixtures though. "County cup competitions will be staged there, and it will form a permanent base for our U5s to U8s and U9s, with all other teams rotating through the site," says Graham, whose three sons have all played for the club. One of Pannal Sports JFC's priorities in attracting funding was to expand its mixed and female teams and to ensure the club has at least one Level 1 FA qualified coach per team, Graham explains. Another requirement restricted playing times to daylight hours. "No floodlighting is permitted in the valley in which the land sits," says Graham, "which limits community use. Ideally, we would have wanted to create a 3G synthetic area as well as the natural grass pitches. That said, Harrogate Town AFC plays on a 3G, St John Fisher Catholic High School runs one, as does Rossett Sport Centre locally." STRI are consulting on the project, laying out requirements and specifications for the site following initial soil sampling. "They have worked with us on putting together a programme of ongoing maintenance to ensure the continuing quality of the playing surfaces," says Graham. "The club has to show evidence to the Football Foundation that it has the cashflow to meet maintenance costs for the pitches and the clubhouse and we have to set up a sinking fund for this purpose." "Within the plan, we intend to recruit a part-time facilities manager who will liaise with the grounds contractor on what work they are to undertake." Responsible for the first year's grounds maintenance is principal contractor CLS, who clinched the project after a competitive tendering process. 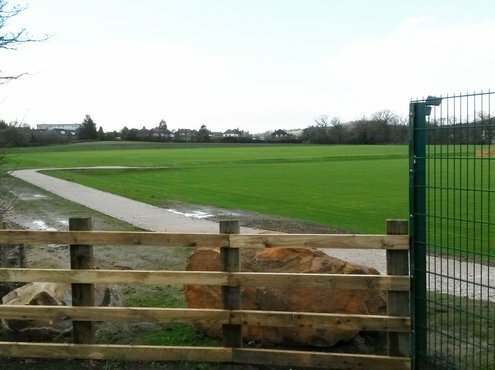 Just over two miles south of Harrogate town centre, what is now named Pannal Community Park saw the redevelopment of a now fallow arable field to include natural pitches catering largely for junior age groups. With a heavy natural soil profile, a 100mm to 200mm clay loam topsoil layer overlies an orange/grey clay subsoil to depth of at least 850mm to 900mm, then medium and high strength sandy, gravelly clay down to at least 2.75m, according to national surveys. The STRI, in its tendering document for the project, notes that the soil locally is "slowly permeable and, without artificial drainage, is seasonally waterlogged for long periods of the winter". From this sloping site has arisen a series of three terraces, each the platform for sportsturf. CLS moved 15,500m3 of earth to fashion the foundation for a cricket square and outfield, two full-size football pitches, U11/U12 areas and a small training zone at the top level, two seven-a-side pitches on the mid terrace and a further two 5-a-side pitches on the lower end near the site earmarked for the car park and clubhouse. 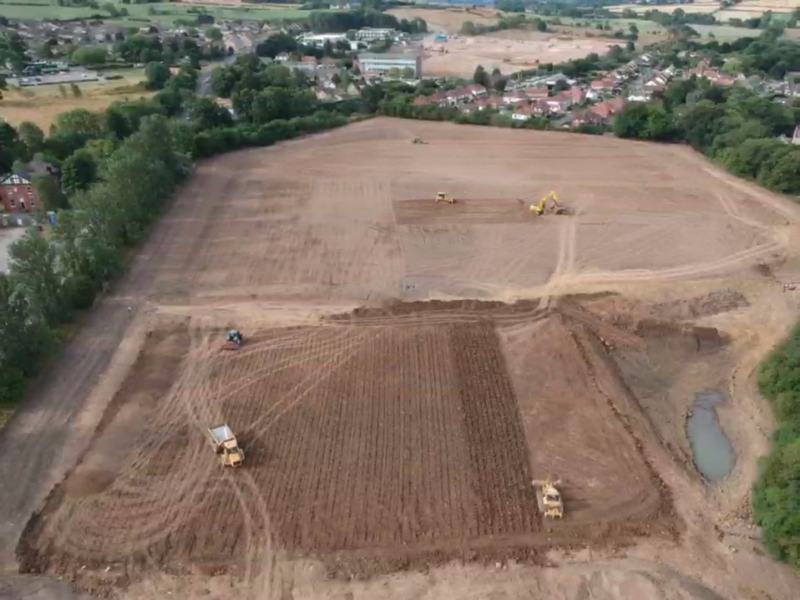 A large clay-lined attenuation pond created on the middle plateau is intended to drain the clubhouse, car park and other areas. "Control of waterflow into the pond and out of it into Crimple Beck, which meanders along the north-western boundary, is via concrete conduits and inlets," explains CLS operations director Brian Dunn. 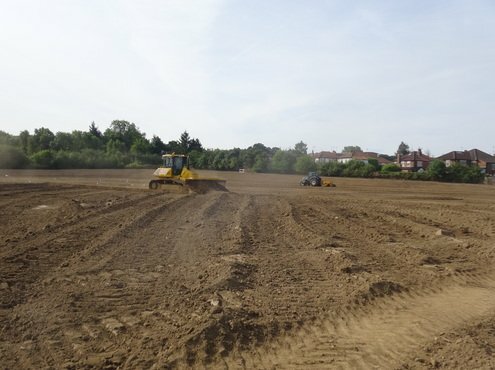 Plant brought in to cut and fill the site included a Komatsu PX61i GPS bulldozer CLS bought specifically for the project, and Hydrema dump trucks, fitted with low ground pressure tyres, he adds. A total of 8,000m3 of topsoil was stripped from the site and progressively replaced as the terraces were created. "We ripped the surface to reduce compaction then reapplied topsoil, followed by cultivation, stone raking and final grading, before installing 80mm lateral drainage at 4m centres beneath all the playing surfaces, as well as cut-off drains to catch water off the banksides. These connected into outfall silt chambers then from there to the attenuation pond." Top drains at 500mm centres, lying 90 degrees to the laterals, followed using a Koro Topdrainer to trench and backfill, again across all playing areas on the three plateaux. 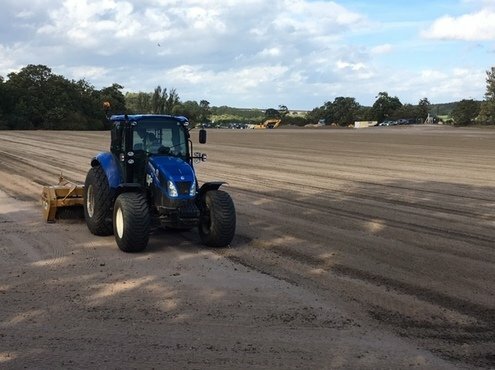 "A 25mm sand layer, lightly cultivated into the topsoil, further aids drainage from the surface to the playing surfaces, providing medium fine amelioration before we seeded with Barenbrug Bar 7 sports ryegrass mix." Around April time, CLS kicks off the initial ground maintenance, removing any remaining stones, rolling the surface then mowing. "For the first eight cuts, we'll use our Iseki ride-on rotary fortnightly, starting when the grass reaches 60mm height and cutting down to 50mm," Brian explains. "Then the Ransomes ride-on triple cylinder mower comes into play in the growing season and we'll reduce cut height to 35mm with weekly then twice weekly runs, ready for handover of the site at the end of September, applying further dressings of fertiliser and sand topdressing as required, together with overseeding, selective weed control and verti-draining." Already in place is the perimeter maintenance access track to the pitches and the main access road to the clubhouse and car park areas. Still to be laid is the trim trail, running just inside the boundary fence. "Open to the public, it'll be timber-edged, with type 1 stone and a grit binding layer," Brian confirms. Reflecting on the project, he concludes: "The weather was with us last year in what was the hottest summer on record. We lost only eight or nine days in our four and half months on site. "This was a large quantity of earth to shift, but the cut and fill process balanced out nicely and other elements of the job fell into place." "Working closely alongside a grassroots sports club makes you appreciate just how much voluntary work is necessary to see a project like this come to fruition." Football is not the only winner here. A 6-wicket county standard cricket square is greening up ready for the first work on it. "After a light trim around April or May, we'll import and lay a 100mm layer of cricket loam, prepare the surface for overseeding and apply pre-seed fertiliser," Brian explains. The contractor will have to cross the football playing areas to reach the square, laid out on the top platform. "We'll use a mini excavator, compact tractor with low pressure tyres and laser grader for applying the loam, then a dimple seeder," he adds. Ready for irrigating the square, 32mm piping links a water hydrant at a corner of the square to a supply source at the other end of the site, where the clubhouse will be built. When the time comes, the club will mark out then roll the wickets - hiring turf machinery from the local rugby club for the maintenance programme stipulated. On its website, the club quotes Edson Arantes do Nascimento - Brazilian world football legend and ambassador Pele. "Success is no accident. It is hard work, perseverance, learning, studying, sacrifice and most of all, love of what you are doing or learning to do." His words form a timely and appropriate reminder of the level of commitment needed to bring on high-quality sports facilities at grassroots level.